Roll it to the edge of the pool. Flip it down. Square it to the pool edge with built-in stop. 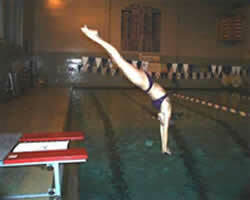 Start diving. All surfaces in contact with the pool deck have rubber protection. Step onto the deck. Hurdle and go. Steps are traction surfaced. Springs and frames are covered with 1 1/2" pads. Opened weaves string bed for improved traction and water drainage. Bed is chemically resistant. Springs are heavy duty and zinc plated. From the deck, to the bed, to the water. Bed extends beyond the edge of the pool with no obstructions between the bed and the water. Bed is back loaded to give an outward kick similar to a diving board. 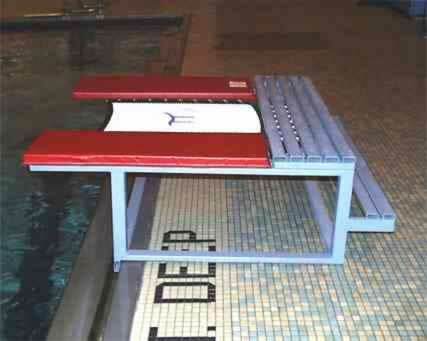 The unit is designed for divers of all sizes, skill levels and weights. 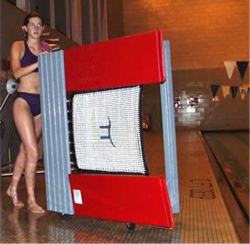 These units are designed as a training tool for competitive diving and will only be sold to experienced diving programs. Plus Shipping. All shipping is freight collect from East Lake, Ohio. Delivery time is 4-6 weeks.